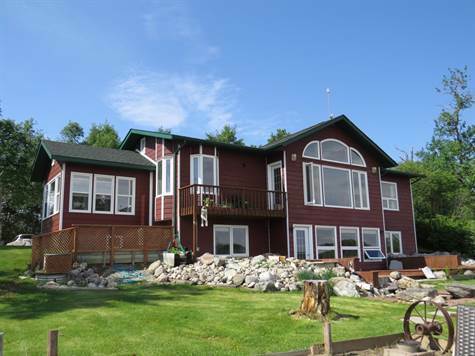 Private Lakefront Acreage! Built in 2001, this 2+2 bedroom home, nestled on 46 acres among mature trees and overlooking a private lake, features vaulted ceilings, an open style concept, with stunning waterfront views from every room. With 2600+ sqft of total living space and a 900sqft 2 bedroom year round guest house, this property boasts an abundance of opportunity. This home was built with comfort and relaxation in mind. Enjoy the sunroom off the master, an ensuite with jetted tub with built-in skylights, a wet bar for entertaining, a dock and swimming area ready to enjoy, all while taking in the peacefulness of the private setting. Located 1 mile off of Hwy #10, within a 15-minute drive to Riding Mountain National Park or a 45-minute drive to Brandon, this home shares the best of both worlds.